These man-made materials make for versatile flooring options, which can be used in wet areas as well as with underfloor heating. They are ideal for open-plan layouts and 'zoning', while the simplicity of resin and concrete flooring will help create a feeling of space, especially if you pick a glossy or polished finish. If you're still considering your flooring options, you might find our guide to how to choose the best kitchen flooring and how to choose the best bathroom flooring, helpful reads. Most polished concrete flooring today is made from a cement-based coating with added polymers, and applied as a ‘screed’ by hand, rather than being poured like a resin. Architectural in appearance, concrete is ideal for creating an industrial look and can also usually be laid on existing substrates, including existing tiles, as long as there is suitable stability, and that it is free of movement and moisture. Concrete flooring generally has a more natural appearance than resin and often comes in a choice of finishes — from smooth and polished to pitted, rugged, brushed and raked, as well as with travertine and stone effects. How much will a poured concrete floor cost? The cost of a poured floor is highly dependent on the work involved and the size of the room, so it is usually calculated on a case-by-case basis. The larger the room, the cheaper each square metre will cost, which is one of the reasons a poured concrete floor is suitable for open-plan areas. If a substrate or structural layer needs to be applied to the ground before the flooring is poured, this will increase the cost of installation. Find our more about creating an open-plan layout in an old home. There are many finishes, polishes, seals and coatings that can be applied to a concrete floor to achieve a specific finish. The more specialised your choice, the higher the cost. The broad quote given by most concrete flooring companies is upwards of £100 per square metre, with the average cost being £130 per square metre. Concrete tiles are a cheaper alternative to poured concrete and are, in some cases, more practical. If you need to lift the flooring to fix underfloor heating or if a section of flooring is damaged, it is far easier to take up individual tiles, than to remove a section of poured flooring. Tiles will have to be sealed and finished in the same way as a poured concrete floor, but it is a job you can easily do yourself. Concrete sealant is readily available from DIY warehouses and it is possible to buy, or even rent, a floor polisher for far less than you would pay a professional to do it for you. How much do concrete tiles cost? Concrete tiles are a great budget alternative to a poured concrete floor and cost anywhere from £2 for a 45cm x 45cm tile from a builders' merchant or DIY store. They are available in a range of shades, from very pale greys to dark charcoal, and can even be coloured. You can also pick them up in a variety of shapes, sizes and thicknesses. Renting a floor polisher from a tool hire centre will cost around £50 a day, £70 for the weekend, or £120 for a week. These come with a variety of functions and attachments, so that you can grind any unevenness and level the tiles before cleaning and polishing them. On top of that, concrete sealant covers roughly 10 square metres per litre, and a 2.5ltr can costs £23.99. Want the look of concrete flooring without the price tag? Concrete effect tiles are usually made from hardwearing porcelain. Many can be used both inside and out, too. As for prices, expect to pay porcelain prices – anything from £20 per square metre. Find out how to choose the best porcelain and ceramic floor tiles in our specialist guide. What is resin and what are its benefits? Resin flooring varies according to the manufacturer, but is made from synthetic materials such as polyurethane or epoxy resins, or, in some cases, natural materials. Resin flooring is poured on site for a perfectly flat finish. It is waterproof and hygienic, as well as anti-slip and low-maintenance, and can be used with most types of underfloor heating. It can be installed on any stable substrate, provided that it is free of movement and moisture. It won’t crack, become loose or peel off over time. Additionally, resin adopts the given room’s ambient temperature, which makes it warm in the winter and cool during summer. The colour possibilities for resin are endless, and flooring can be found in every shade in the RAL and NCS colour charts. Some companies also offer options for quartz and decorative flakes, which can be added to the resin. How much does poured resin flooring cost? With resin flooring, as with concrete, the larger the room, the cheaper each square metre will cost. A resin floor can be applied as a thin layer on top of an already existing floor structure, and this will be cheaper than installing a whole floor from scratch. Resin flooring may need to be finished with an anti-slip coating which will add to the cost. If a substrate or structural layer needs to be applied to the ground before the flooring is poured, this will increase the cost of installation. The average costs are similar: expect to pay upwards of £100 depending on your specifications. Where should you use resin or concrete flooring? 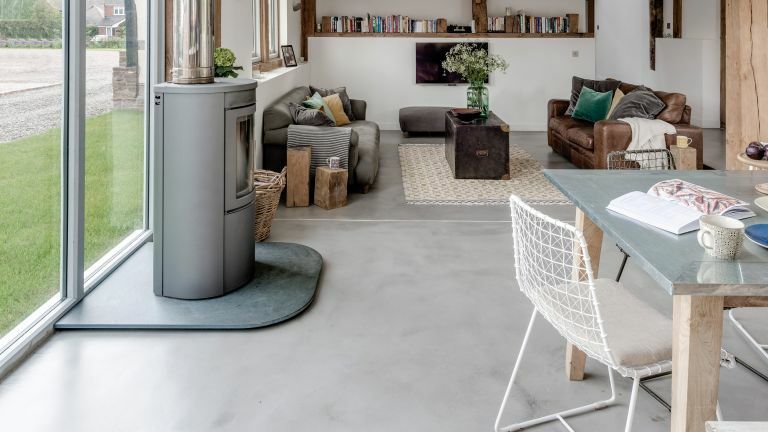 You can use a concrete or resin floor in any room in the house, and although it may seem like they are only appropriate for modern homes, the variation of colours and textures makes them suitable and practical in any home. They were originally designed for the commercial sector because they are hardwearing, hygienic and low maintenance. The glossy finish of a resin or polished concrete floor is a good way of reflecting light around a space. Incorporating it within a kitchen extension, with plenty of glazing, is a sure fire way to create a naturally light area. Polished concrete in particular is the flooring option of choice for those looking to create an industrial style kitchen. With the correct seal, they are waterproof, stain resistant and anti-slip, so are perfect for use in the kitchen or the bathroom. Poured floorings are seamless, and lend themselves to the continuous look of an open plan space. They can also be used outdoors, so they offer the perfect opportunity to incorporate the same flooring throughout, making the garden feel connected to the rest of the house. If you are going for a minimalist look in a bedroom, whether its part of a contemporary or Scandinavian scheme, resin flooring makes a practical replacement for floorboards and complements a streamlined style. Poured concrete flooring or resin is sold as a supply-and-fit product and should be laid by a professional, who should also give you a warranty or guarantee for the work. If you opt for cost effective concrete flags, you can either pay a professional to do the job, or with enough time and a bit of patience, you can DIY it. Similarly, you could employ someone to finish the floor for you, but again this is a job that you can successfully complete yourself. Resin flooring is a highly specialised product and can only really be applied by a professional. It has made the move from the commercial sector recently; so cheaper alternatives either don’t exist, or haven’t found their way to the market yet. Both resin and concrete floors are very low-maintenance: simply sweep away any debris then use a recommended cleaner. Most concrete and resin floors only need mopping with a damp cloth, but some can also be steam-cleaned. You may also be required to apply a clear glaze, wax or sealant every now and again to protect the surface from minor scratches. Check out our pick of the best steam cleaners so you can really easily keep your concrete or resin floor clean.